My alter ego, Chauncey Gardiner, joins me (again) for this post, which is prompted, no doubt, by an August spent pulling weeds in the bog garden and thinking/writing about U.S.-Pakistan nuclear relations. 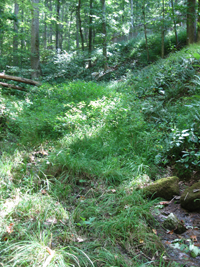 Restoration Creek – just a trickle, really – winds its way through the woods behind the house from a spring at the base of Tom Mountain. The area below the cistern is relatively flat, boggy and quite beautiful in the winter and spring. In the summer and fall, it is overrun by silt grass, jewel weed and other opportunists, an object lesson that weeds threaten to take over the world. Being a fern-oriented, compulsive person, I thought that I might help the bog show off during all four seasons. Leaving aside the hubris of this decision, I set out to remove weeds on my enemies list from part of the bog, liberating spaces to transplant ferns and groundcovers that enjoy playing in the mud. The results look spectacular, if I do say so myself, but this may well be a holding action. Or the results may be completely ephemeral, especially after I am no longer the steward of this land. I do not know how many seeds a single blade of silt grass can sow, but I suspect it is a very large number. So why is this landscaping worth the effort? For starters, progress is tangible (as well as reversible), and I need a healthy diversion from being in my head. There are pragmatic reasons, too. 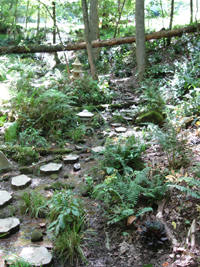 If I let the weeds completely have their way along the creek bed, they will spread to other landscaped areas. If I establish some sort of a perimeter, and plant screens to keep the weeds down, my bog garden may eventually take hold, with far less maintenance. Only time will tell. I do know this: Giving in to “the inevitable” is not a very satisfying option. I can’t beat something with nothing. I therefore attend to my weed population. Can you see where I’m headed? Over the next decade, the most serious nuclear competition in the world will take place in southern Asia. China will continue to modernize its nuclear forces. Pakistan is expanding its production capacity to make nuclear weapons so that it can compete effectively against India and compensate for New Delhi’s growing conventional advantages. All three countries are modernizing their ballistic missiles and inducting nuclear-capable cruise missiles. India is intent on having a triad, which means that some in Pakistan will want one, too. The separation of warheads from launchers – one bulwark of crisis and strategic stability in southern Asia – is not compatible with nuclear capabilities at sea. Over the next decade, New Delhi may deploy limited ballistic missile defenses, and both India and Pakistan might once again test nuclear devices. The United States has very little leverage to dampen this triangular competition. If truth be told, Washington has more capability to raise nuclear requirements in the region than to diminish them. (Think, for example, in terms of prospective U.S. arms sales and technology transfers related to advanced fighters and BMD to India.) Washington’s impact on nuclear issues is especially marginal in Pakistan after the Bush administration’s civil nuclear cooperation agreement with India. This deal hasn’t exactly increased U.S. influence in India, either: After benefitting greatly from the Bush administration’s largesse, New Delhi returned the favor by passing liability legislation making it either very hard or impossible for U.S. companies to get a piece of the pie. Weed control is a very poor analogy for controlling nuclear weapons, but that’s what happens when you mix work with pleasure. The Obama administration can try to help Pakistan and India improve bilateral relations and establish perimeters around nuclear risks. Alternatively, Washington can let nature take its course. Option #2 is downright unnatural. Washington has marginal influence, but working at the margins is all that is presently available. It’s also where ways and means can be found to help Pakistan and India find deterrence stability during a very difficult passage. It is clear that Bush’s ill-thought plan at aiding Indian proliferation activities had had an extremely deleterious effect on peace in South Asia. One cannot be surprised at Pakistan wanting to at least attain parity in overall dimensions with India. Is there an unconscious assumption that the 1946-1962 period in Soviet-American relations will be re-enacted in the region, with each countries respective version of Edward Teller pushing for more resources, until the inevitable near-miss of an October 1962, followed by a SALT I treaty moment? FSB – Thank you. Not only do the self appointed weed-controllers have over grown weeds in their own gardens, but have a propensity to be very selective of whose garden they would like to landscape. In this case Michael selects South Asia as against the dangers of nuclear armed and kitted U.S. military forces playing in the gardens of Russia, the pacific Rim and the Persian gulf. There is no atempt to weed these highly radioactive gardens. Furthermore, its a little frustrating to repeatedly hear of Pakistan’s quantitatively increasing nuclear inventories. I would like to ask – what are the geostrategic parameters that go into management of strategic assets – in peace and war – and how do these constrain deployment and management of large numbers? One is tempted to simply say “Kashmir”, or as I have seen written in one or two places, “the road to Kabul runs through Kashmir”. If the US wants to sort out its problems in Afghanistan, it seems it is going to have to engage much more intensively with the Kashmir issue. Appreciate your thoughts and analogies. You say that “Washington” and the Obama administration should try to influence this set of interactions. The last time, that I’m aware of, that Washington engaged New Delhi and Islamabad officially on the subject of nuclear weapons and stability at a senior level was when DepSec Talbott did it in late Clinton administration after the 1998 tests. If such discussions took place as part of the U.S.-India civ nuke deal negotiations, I’d be interested to hear. Perhaps Ashley Tellis engaged the Indians on these issues when he was at the U.S. Embassy in New Delhi. I simply don’t know. Are you recommending that the U.S. place these issues formally back on the agenda when we have high-level discussions with India and Pakistan(such as the Defense Ministerial with India this fall or the Presidential visit)? Where would these discussions be most effective? Should they be formal and high-level? Based on your extensive experience, can or should Track 2 or 1.5 talks on these be reinvigorated? Can unofficial talks be effective in the post-test South Asia world? What about engaging the Chinese similarly? That seems like a really tough nut to crack although without them in the mix, even efforts on the margins may produce no results. I’d welcome more ruminations on this important topic. Nothing new in a ‘act on impulse, think never’ Bush policy producing unexpected results. The important thing is that Pakistan harbors an intense paranoia about India which regularly bested it in the first quarter century of their existence. India, rightfully so, views Pakistan as it’s major strategic problem. India has been changing it’s attitude towards Pakistan, though the terrorist attack a few years back caused a setback. The Eisenhower administration gave India some encouragement to develop nuclear weapons before China. The Reagan administration gave tacit approval and perhaps some active aid to Pakistan in pursuing it’s ‘Islamic Bomb’ (as many called it in the 1980s). I think the best thing the US could do is stay out of things. We might also start obeying the NPT ourselves. Given the nature of civil-military relations in India, it will take a lot to get the government to allow fully mated missiles on submarines. Certainly the time has come for India to declare that they accept the idea of strategic parity with Pakistan. The problem is that there is no parity in the real world, just as there wasn’t in the case of the US and the Soviet Union. The other problem is China. How does one get a triangular nuclear arms reduction system going ? Michael needs to realise there is no weed/plant differentiation in the nuclear world. We’re all in it together.